Not long ago a college-age young man came for a Quantum Healing Hypnosis session. He came quite a long ways and was accompanied by his mother. The main complaint was severe anxiety and type 1 diabetes. He was checking his blood sugar several times a day and using insulin. The very first thing I made sure to find out, was whether or not the young man was there of his own volition. It seemed his mother had done the research and had been the one to discover and suggest QHHT and in fact even went so far as to make the actual appointment. This can be acceptable, as long as the “other” person was willing and interested in a session. This rarely is successful if they are doing the exploration for the interested party and not themselves. I said as much to the mother when she booked the time and was assured her son was onboard, just very busy at college and so she was making all of the arrangements. And so they both made the trip to Kansas. Before even starting to talk about what was troubling this young man, it was important to make certain he absolutely wanted to be there and was open to QHHT. After a very long talk and interview it was apparent that “Chris” was quite keen on the idea of exploring his consciousness and was very willing and interested in discovering the cause, and hopefully find some answers or solutions for his issues. Chris had an apparently idyllic childhood. His parents were kind and loving and there was no reports of fighting or disagreements of any kind. He had siblings he loved and cared for as well. His early schooling years were uneventful and he had a steady girlfriend and was in a stable relationship with her. He had a hobby of working on old cars, especially old farm trucks. He was in an ivy league school, at great expense and sacrifice to his parents. He was an above average student but had to work hard to keep up his grades. He wasn’t very interested in the subject he was studying: Mechanical Engineering, but he was fairly good at it and passed the exams to get into the school. It was a tough program and a prestigious school to get into and his parents were thrilled at his acceptance. He was only about halfway through his studies. The diabetes came “out of no where” while he was in high school. There was no history of it in his family and it was currently managed by insulin and frequent blood sugar tests throughout the day. The anxiety came and went, and he had medication for that as well, but he did not like to use it. Some people prefer an alternative form of treatment for anxiety such as cannabis. It is now common for dispensary supplies to include vapes and other things. However, there are other treatments available and it certainly isn’t a one size fits all situation. Chris easily went into a deep trance state and found himself walking along a beautiful wooded path. He walked for a while in the woods, apparently as a young man, much like himself, describing the peace and tranquility he was observing. He was alone but not lonely and happy to be headed to where he was going. Where was that? Well, he soon came upon a building. He walked inside. 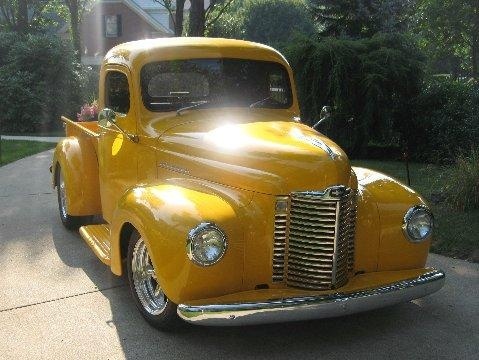 It was a well appointed garage and there in the middle of the main bay was a beautiful old yellow farm truck. It was in the end stages of refurbishing. The chrome was shiny, the paint perfect, and it gleamed in the sunlight. After a bit more exploration around the shop, it comes to his mind that this shop is actually HIS. Everything in it is what he likes. His music, his projects, the view outside into the woods. He is extremely content here and joyously works on the old vehicles in solitude. When it came time to speak to Chris’ High Self, I asked why this “life” and or this scene was shown to Chris. The High Self explained that this was Chris’ dream and vision of his perfect future, of his perfect life, the life he wanted to create for himself. It allowed him to feel, fully, what it would be like to be completely in charge of his own projects and his own time and space. We then asked for a body scan and asked about the diabetes and anxiety. The High Self explained that the diabetes was brought on as a result of the decision Chris made in High School to live his life as his parents had in mind for him to live. He was denying and crushing his own dream in order to try to please them. He loved his parents very much and they him. He loved them so much, he made the decision to go to Mechanical Engineering school to fulfill the dream they had for him to make them happy. He did not want to disappoint them in any way. The anxiety he felt had to do with the schooling itself. He was forcing himself to do the work, to take the tests, to even be on campus around so many people. He did not enjoy any part of it at all and each day and all of his activities were dreaded. Deep down, the High Self explained that Chris wanted to quit school in the worst way and just get on with his true passion of working on old cars and trucks, but he kept that passion locked up like a prisoner inside of him. This denial of passion therefore, denying himself “the sweetness” of life that he could be living became manifest as diabetes. The anxiety of performing daily tasks he despised was another signal he was in the wrong place, doing the wrong thing. When Chris sat up out of trance he was exuding calmness and happiness. He remembered most of the part of the session where he was in the woods and exploring the workshop and its contents. He relayed even more details and talked about how good it felt when he understood this was his very own workshop, filled with his own tools and equipment and projects. He talked extensively about the colors and the feeling of peace and solitude the woods that surrounded the building gave him. He did not remember nearly as much, the details of when the High Self was speaking. We talked about what it had said. I told him to listen to his session recording carefully and to make his own decision. As amazing as QHHT is in uncovering what our High Self wishes for us, what our High Self has planned for us, we know that it is our own free will that is paramount in this life. A few weeks later I heard back from Chris. He said he was feeling much better. He said his blood sugar level normalized so much after the session he needed little to no insuline for many days afterwards. He said although it was still greatly improved from before our visit, it had recently started to spike up again. I asked him if he quit school yet. He said no. I asked him if he told his parents what his High Self said, about what to do to become healthy and happy. He said no, he just couldn’t do that to them because he loved them too much. I remain hopeful for Chris’ future both for his health for his and occupation. He has been told the underlying reason he manifested his diabetes. Perhaps he will leave the ME school soon and start living his own life or maybe he will just finish ME school and then get back to his real passion as soon as possible. Maybe his parents will make it easy for him to follow his real dreams. QHHT is amazing and provides wonderful opportunities for healing and understanding. However, free will absolutely reigns and one always has a choice in life. It is one of the reasons, and some would say one of the most important reasons we all have chosen the Earth School; to understand and have access to free will and choices. This entry was posted in Candace Craw-Goldman, Dolores Cannon, Health, Quantum Healing Hypnosis Technique, Regression. Bookmark the permalink. Always so great to hear from you Barbara! This is such a common story! I think, don’t you…this is why we incarnated on Earth at this time? To be so very strong as to make these choices to change the very reality on earth? How many people are getting up every day and doing things they do not love to do but feel compelled to do them by duty or convention? What if more of us could do this, would that not only help us but truly change the world? Thank you for your comment and voice here Barbara! Much appreciated and best of luck in your NEW LIFE. I will be thinking of you.